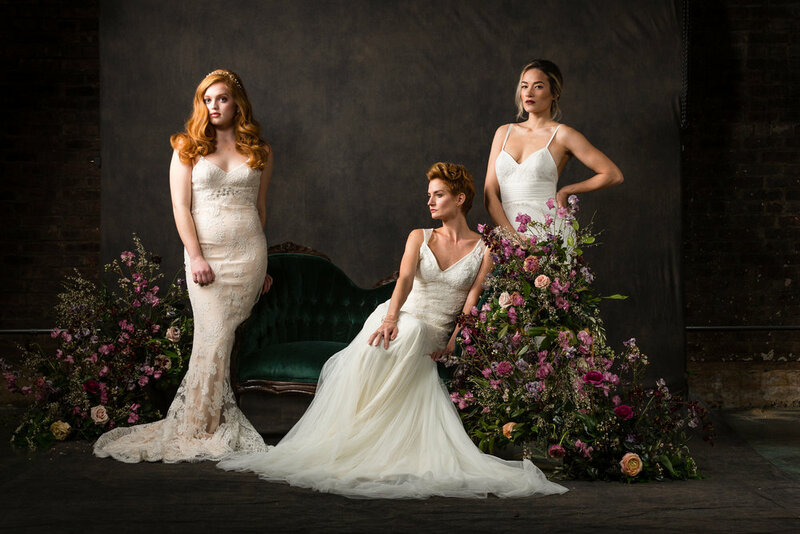 So grateful we were able to be a part of such a special Bridal shoot for the NJ Bride 2018 cover! Loved everything about this! Thank you to all of the following vendors who helped make this be so beautiful. Being inspired by where the modern bride is today, is what keeps me passionate about always creating looks that compliment the classic, modern, boho and alternative bride. These looks were created to inspire any woman looking to embrace their natural beauty, be bold with an editorial flare, create romance or be an ethereal queen. Be Fearless, Be bold, be YOU! This collaboration came very natural to me as the visions of Spring and Summer weddings came to me. 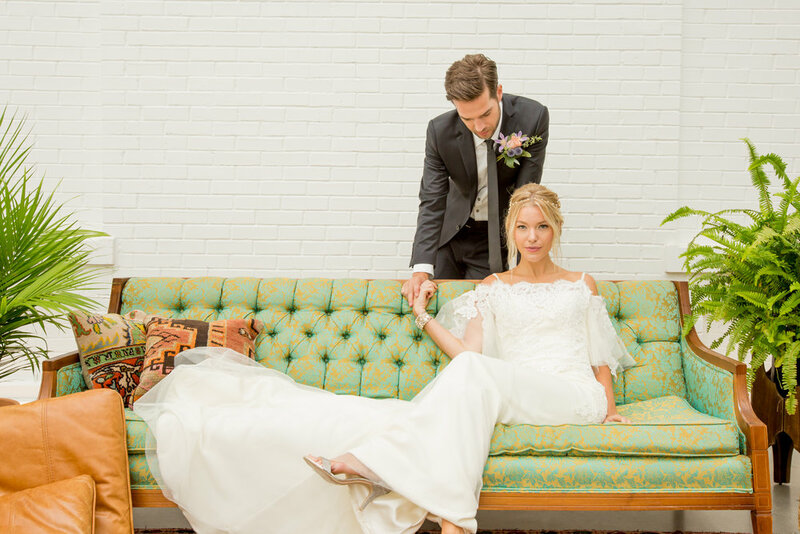 I love a Boho Chíc Bride, who is open to Beauty that is soft, feminine and strong. I felt Andrew Holtz would capture the mood of the end of Winter, and into Spring at his incredible 1st floor studio located just below us in the Lakehouse Music Building. He has an eye that captures details, color and emotion. Our vision was the same, and together we knew this shoot would not be as magical without the Vintage Furniture accents and incredible floral arrangements by Amanda and Joanna of Faye + Renee. Their choice of colors, textures and shapes can accentuate the brides feeling in any photography shot and most importantly at her wedding. Together we created a beautiful inspiration board full of beauty and talent. Hopefully they inspire your wedding day. With the beginning of Spring 2017 upon us, when I think Bridal, I was consumed with the softness, femininity, classic shade of pink. It is refreshing, it is airy, it is soft and timeless. Accents of pink in your flowers, the underlay of your dress or on your lips, is the perfect hue for weddings this season. Every detail in your wedding is what helps to bring your theme to life! The type of flowers you use, the color, the shapes of your arrangements can take a classic wedding look to a rustic, boho dream. Floral Designers Faye + Renee create the most perfect arrangement for this girly vision of bridal. There is nothing I love more than working with a wedding dream team. After so many years working in NYC and styling hundreds of brides in beautiful venues with wonderful vendors, I don't think I have been more excited in my bridal career as I am right now. My love for bridal hair runs deep, and I am extremely excited to bring it back home to NJ, specifically Asbury Park. There are wonderful spaces in this city that are great for weddings. Wether you are a bride looking for a romantic cocktail reception with water front views, a traditional ball room and sit down dinner, or an open rustic style dance party, there is something here for everyone. Here we showcase the newly opened creative and fun space, The Asbury Hotel. A lovely venue with different uniquely styled rooms, for couples who have a love for architecture and are creative when it comes to open spaces. A very special thank you to all of the wonderful vendors who worked together with me to create this vision and make it come to life. Everything about this wedding photography is beautiful, classic and the ultimate wedding wish for any couple. I look forward to introducing my brides to all of you and creating incredible weddings together. It was the BEST way to meet and collaborate with you all.